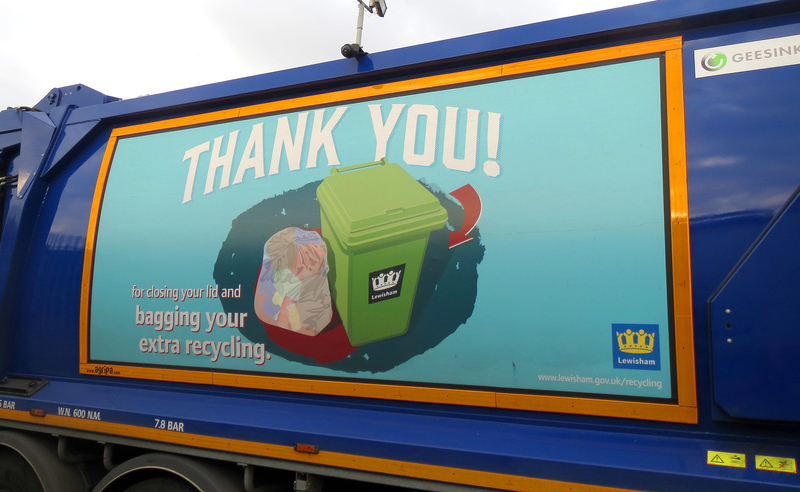 If you haven’t seen them already, then next time you hear a refuse or recycling vehicle coming down your street, have a look out the window at the new livery on the sides of the trucks. 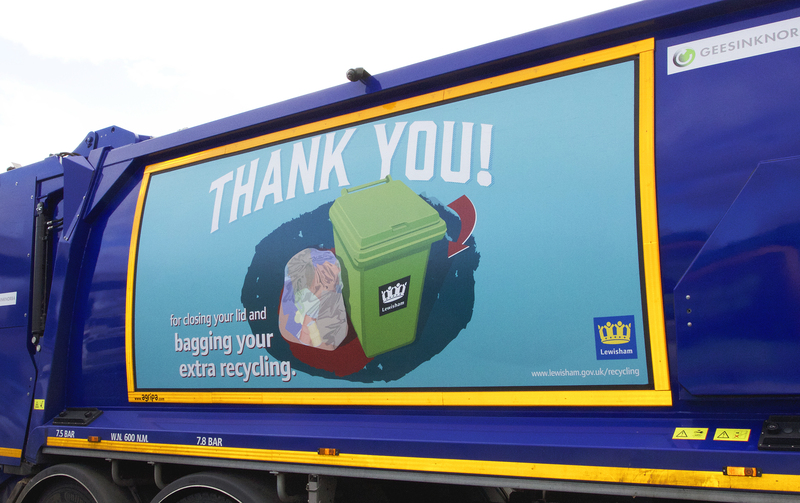 Thank you – for bagging your extra recycling. Most of the borough should now be familiar with the new Service Standards that we have been rolling out since July 2013. Many of our new trucks are also being used to to carry those Service Standards messages and more importantly to say thank you to all those people that have helped to make the transition an easy one. The Service Standards have been brought in to bring Lewisham’s refuse and recycling services in line with what most London boroughs and council’s nationwide are doing with regard to their collections. They are also being used to encourage waste minimisation as we are now not collecting any additional waste that is left by your bin (known as side waste). 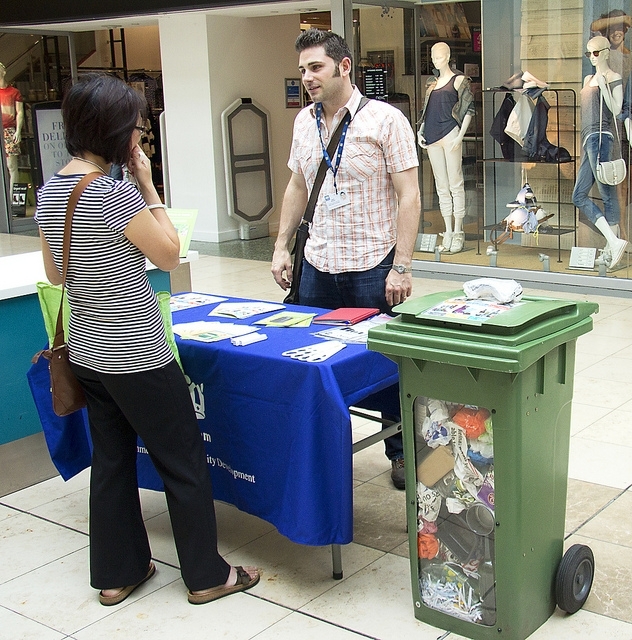 Residents are also being asked to ensure that their lids go completely down on their refuse bins and not to place green waste, building or DIY waste or waste electrical and electronic equipment (WEEE) in the bin. 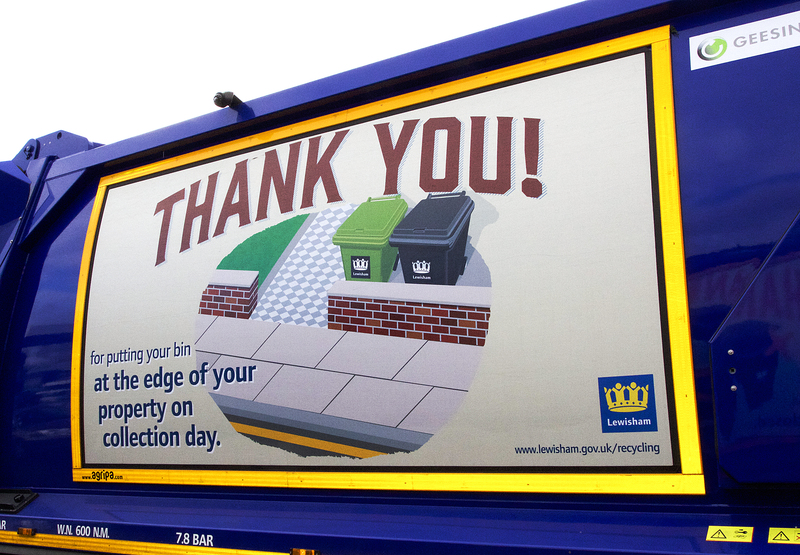 Thank you – for putting your bin at the edge of your property on collection day. As well the above, all residents are also being asked to bring their bins (refuse and recycling) to the inside edge or boundary of their property on collection day by 6am. Crews have been instructed to only collect those bins that are at the boundary and those that are not placed there will not be collected. 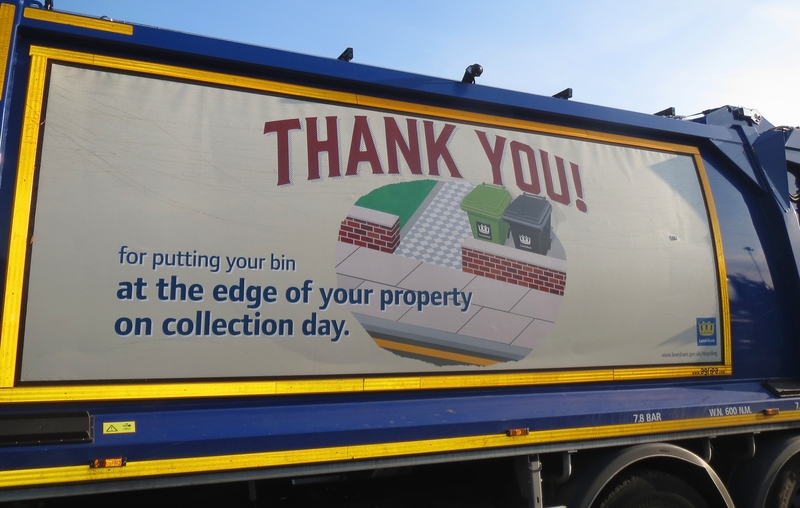 The only exception to this is if you are entitled to an assisted collection, in which case our crews will collect and return your bins to where you keep them. The Service Standards have been bedded in in most of the borough now and there are just a few more rounds to go now before the entire borough is completed. When the borough is fully rolled out, our crews will adopt the rule that if your bins are not out on the day of collection, then we will assume that you do not want a collection or are on holiday. There are many people in the borough that are happy with this arrangement as a lot of people don’t need a collection every week. If bins are out at the inside edge or boundary of your property, our crews will empty them and return them to the outside edge where you as a resident are expected to bring them in off the street until your next collection the following week. 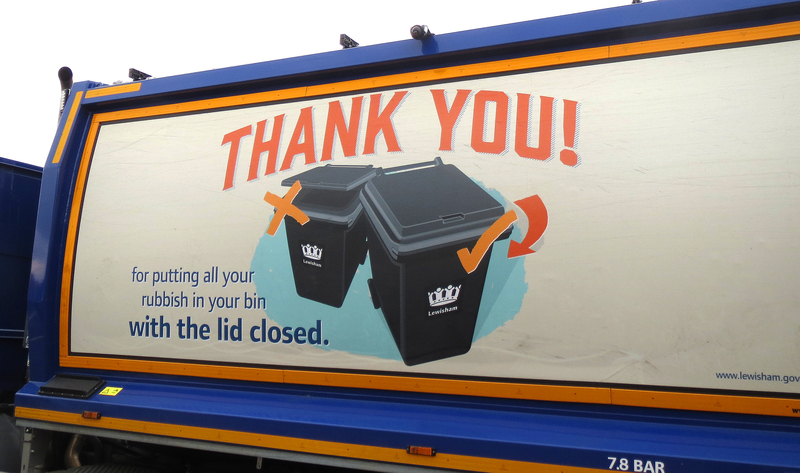 We are also encouraging residents to number their bins as well to prevent bin theft and to make it easier for our crews to identify where the bins came from. 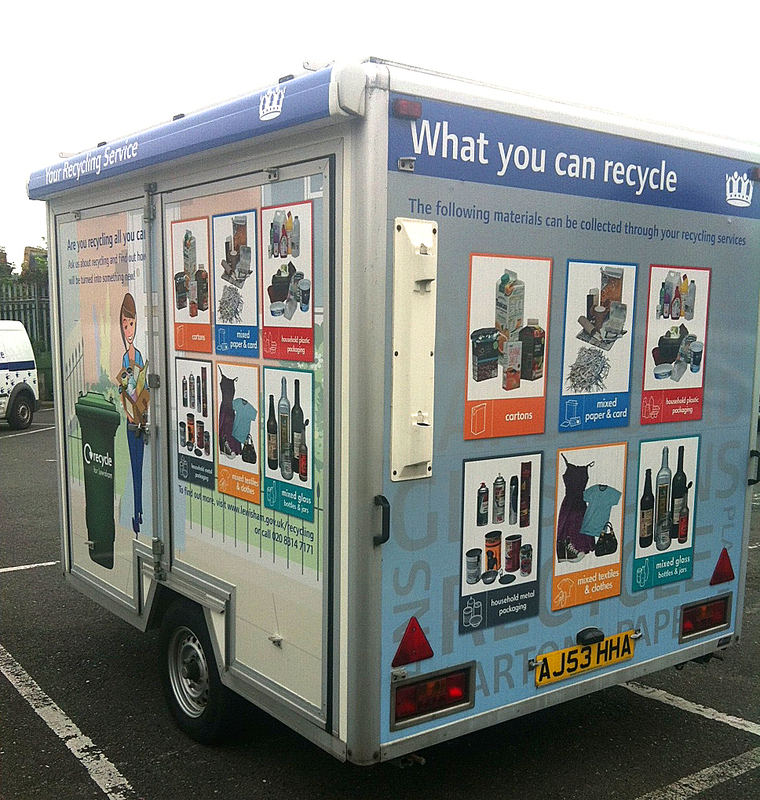 Categories: 180l bins, community engagement, Environmental Campaigns, recycling | Tags: Bin at the edge of your property, Lewisham bins, Lewisham refuse service, Lewisham Service Standards, recycling trucks, Refuse trucks, Service Standards, Thank you | Permalink.